In full disclosure, Uncle Milton provided us with the T-REXcavator at no cost to us in exchange for our honest review. Do your kids LOVE dinosaurs? Are you looking for a game that is fun AND educational? Well, I have the perfect game for you! Uncle Milton Dino X Team T-REXcavator Dinosaur Excavation Game is a fun, exciting and interactive game that offers a great learning experience for kids ages 5 and up. What kid, especially a little boy, doesn’t love T-Rex? This game allows them to explore and learn all about this amazing dinosaur while also enhancing important developmental skills. One of the things I love about this game is how easy it is to play. The directions are straight forward making it simple for little ones to understand. Each player draws a trivia card which is read by another player. If you get the trivia question correct, then you can “excavate” the bone pictured on the card. 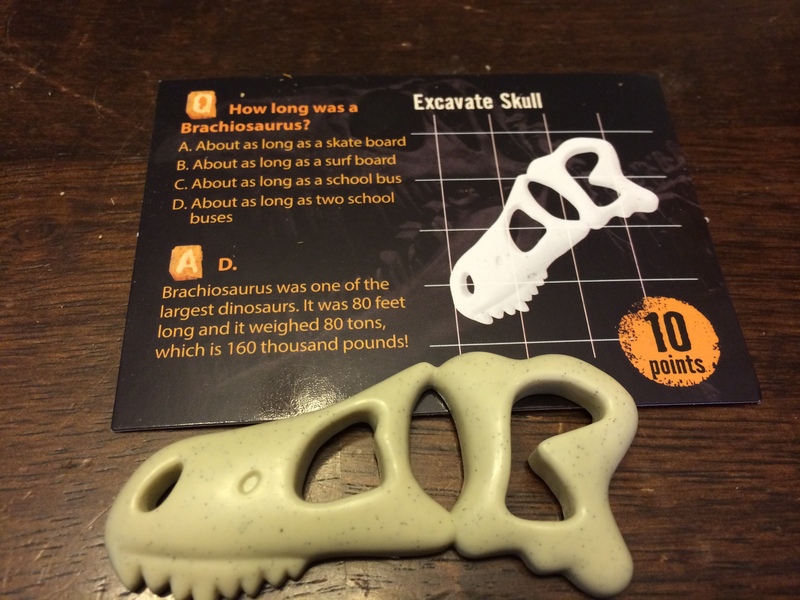 Here is an example of one of the trivia cards and the bone my son excavated! Since my kids are not able to read yet, I read all the trivia questions to them. So don’t shy away from this game just because your kids cannot read! 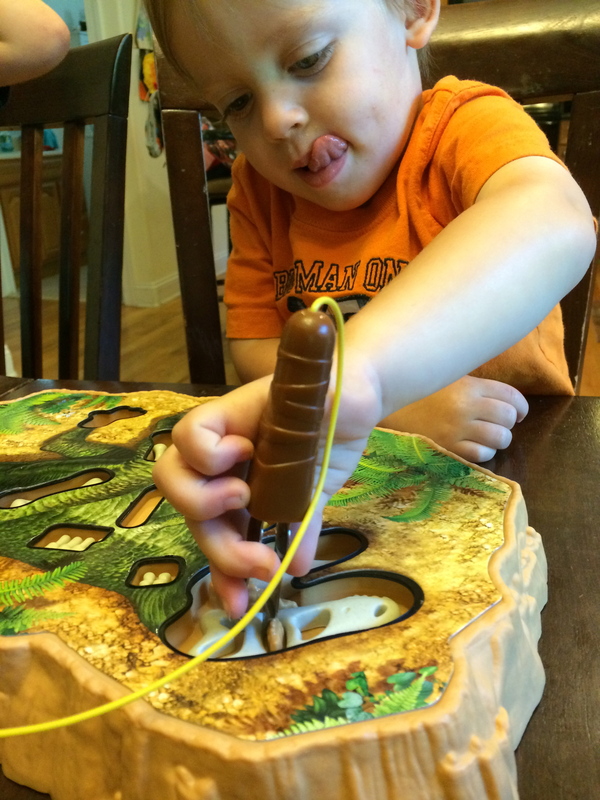 Since T-REXcavator is so great for fine motor development, I actually recommend it for little ones. In fact, my 2.5 year old LOVED playing this game. The players use the excavation tool, which resembles a tweezer, to carefully remove the bones from the electronic board. But be careful!! If you touch the side of the hole, the T-Rex will ROAR back to life! When that happens, you lose a turn. If you succeed, you keep the card and earn the points stated on the card. The person with the most points at the end of the game WINS! It’s that easy! 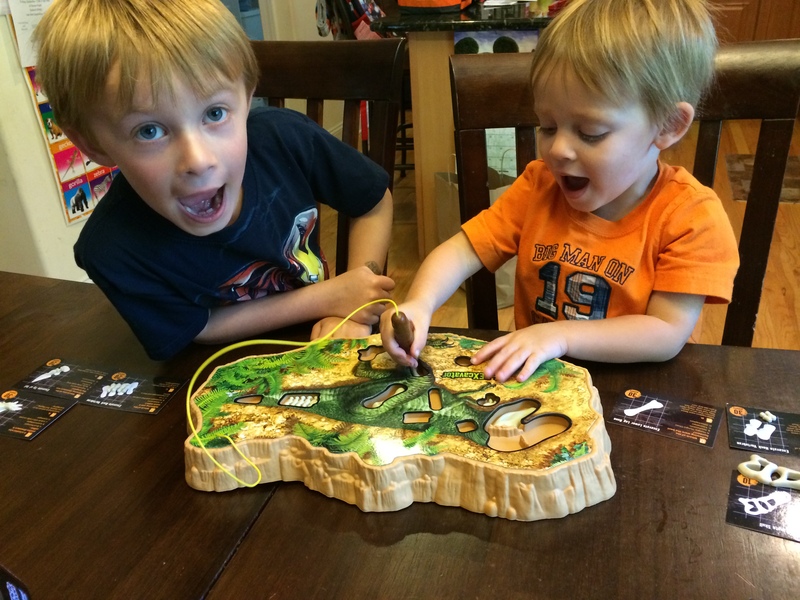 My boys loved when the T-Rex roared! Since they are both little, I bent the rules a little by allowing them to try as many times as they needed to get the bone out so the T-Rex roared A LOT when we played! They were so proud of themselves when they finally excavated the tiny bone. The boys got so excited when T-Rex roared! Sometimes they even roared back! What I loved the most about this game is all its developmental benefits. T-REXcavator is not only a game full of excitement and anticipation, it also offers a great learning experience. I am always looking for games that encourage learning through play. That is exactly what the T-REXcavator does. Enhances Fine Motor Skills: While kids use the small tweezers to retrieve the tiny bones, they are developing their fine motor strength, manipulation and coordination. All skills essential for writing. Increases Academic Knowledge: While answering trivia questions, kids will learn all about dinosaurs and other scientific facts. The T-Rex skeleton also helps teach children body part recognition and body awareness. In addition, adding up the points on the cards helps kids practice their math skills. Boosts Problem Solving Skills: In order to get the bones out, the kids have to problem solve. They can be strategic or use a trial-and-error approach. Either way they are gaining valuable thinking and reasoning skills! Encourages Patience: This game involves a great deal of patience which, let’s face it, is hard for kids. However, they become motivated to succeed which teaches them to take their time and try their best! It also teaches them turn taking skills which is a vital social skill for making friends and succeeding in school. Throughout this game, players are boosting their vocabulary and comprehension skills. They are also strengthening their auditory skills which are essential in school! T-REXcavator helps kids develop valuable developmental skills, and as you can see in this picture, determination and hard work is also emphasized! We LOVED playing with Uncle Milton Dino X Team T-REXcavator. My boys have asked to play with it every day since it arrived. It is the perfect game for family game night as it’s fun for all ages! You can purchase this amazing game from local retailers such as Walmart, Kmart, Sears, Barnes and Noble as well as Amazon.com. Prices vary but I have not seen it for more than $19.99.